"Conning Your Way into a Family"
NO GOOD NICK is a sitcom about a 13-year-old orphan girl that convinces the Thompson family into thinking she’s a long lost relative, so that she can actually rob them. NO GOOD NICK has pretty rough dialogue, but there are some funny and clever moments, plus some positive pro-family moments. Caution is advised for light foul language. 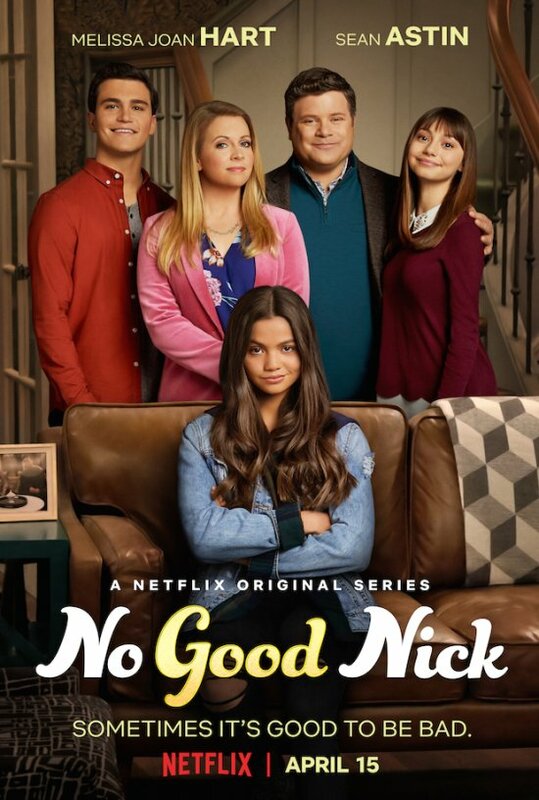 NO GOOD NICK is a family sitcom on Netflix starring Sean Astin and Melissa Joan Hart as Ed and Liz Thompson. Ed and Liz are two busy working parents of teenagers whose lives are dramatically changed when a distant relative who’s been orphaned arrives on their doorstep. The Thompson family looks like any other family. Jeremy just got his driver’s license and is a responsible teenager with big political aspirations. Molly finds her identity in any sort of activism with which she can get involved to boost her social status, whether it be animal activism, or protesting ice cream stands because they discriminate against lactose intolerant people. One day a 13-year-old Nick shows up on their doorstep and states that her parents died in a car accident, and she’s a distant relative of them. Ed and Liz are surprised to say the least, since they never knew Nick existed. Trying to do the decent thing, they let give her a temporary place to stay until they can figure out next steps. However, Nick has ulterior motives. It’s revealed that Nick is actually a con artist and plans to rob the self-absorbed Thompson family. NO GOOD NICK is a cute premise that sometimes lacks creative writing. Situation comedies in particular need fast faced, zingy comedy to hold your attention, and the show isn’t always successful at this. However, Sean Astin and Melissa Joan Hart are always fun to watch, so it’s a particular joy to see them in a series together. Positively, as Nick enters the lives of the Thompson family, while hardened and emotionally distant at first, they begin to let go of their selfishness. Of course, Nick, who’s there to rob them won’t go unchanged herself as they begin to make her a part of the family. It’s a positive message of family and love. There are also a few positive free market capitalist lessons in Episode 2. That said, there are some light profanities (a few OMG’s and a couple uses of “what the he**). Nick’s manipulation does grow a little old too, and Ed and Liz aren’t always the best parents, so caution is advised. NO GOOD NICK is a family sitcom on Netflix starring Sean Astin and Melissa Joan Hart as Ed and Liz Thompson. Ed and Liz are two busy working parents of teenagers whose lives are dramatically changed when a distant relative who’s been orphaned arrives on their doorstep. Already a busy family with two teenagers of their own, Ed and Liz are reluctant to bring Nick into their home, but they eventually make the right decision and do. What they don’t know is that she’s actually conning them so she can rob the family. NO GOOD NICK is a cute premise that sometimes lacks creative writing. Situation comedies need fast faced, zingy comedy to hold your attention, and the show isn’t always successful at this. However, Sean Astin and Melissa Joan Hart are fun to watch, so it’s a particular joy to see them in a series together. As Nick enters the lives of the Thompson family, they begin to let go of their selfishness. That said, there are some light profanities and obscenities, so caution is advised for NO GOOD NICK.